I love wordles, those decorative arrangements of words (they call them ‘word clouds’) that give you a picture of your writing. 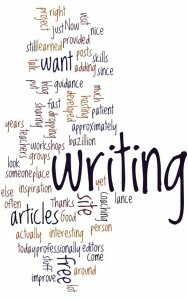 You can copy any text to the wordle web site and see a graphic depiction of your writing. It omits articles and punctuation, but leaves full words. The more often a word is used, the larger the text. The wordle to the left was created from the welcome text, at the top of this blog. You can fool around with the arrangement, colours and typefaces to get something you find pleasing. Wordles are more than decorative. They can be useful, too. As writers, we can use wordle to discover if we’re overusing particular words – or if we’re making a strong enough point. It’s not hard to tell, from my wordle, that this site is all about writing. Try it for yourself! If you want a very interesting message, use the text from your résumé. Next post: It’s Plain Language Day!